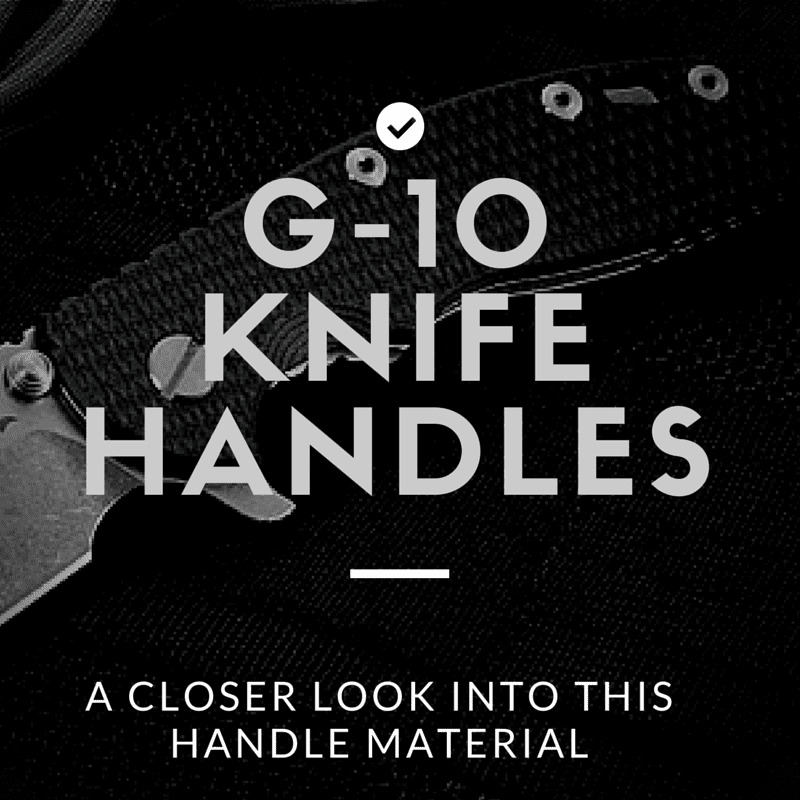 What is A G-10 Knife Handle? A material made by inserting woven glass fiber impregnated with epoxy resin binder through a laminate, G-10 is widely used in electronics and printed circuit boards because it is not electrically conductive. It doesn't shrink and holds forms very well ensuring dimensional stability. It does not absorb water. The name G-10 is sometimes incorrectly used interchangeably with Micarta. Actually, they are related but not identical materials. G-10 is the grandchild of the material called Micarta, now a trademark for a variety of industrial laminates. Micarta was invented by George Westinghouse around 1910. Westinghouse saturated fabric in phenolic formaldehyde resins, laid the saturated fabric in layers then cured the laminates under pressure. G-10 is used in handgun grips, structural supports, mechanical insulation, gears, washers, spacers and precision machined parts for electro-mechanical assemblies as well as high quality knife handles. Basically, G-10 is Micarta made with fiber glass instead of conventional cloth. Layers of fiberglass or fabric are saturated with epoxy and laid on-top of one another to the desired thickness and dried under pressure. These cured and dried form blocks of G-10 then can be formed into handle shape, mounted into the steel sides of the knife, textured or sanded and polished. Micarta can be made using fabrics including parachute cord, denim or even paper. Many knife owners attest to the strength of G-10 made with fiberglass. That's important to note, because glass fibers are what make the G-10 so tough. G-10 is impervious to water and wetness, which means there's never any worry about the damp getting to it. The laminated material is extremely durable, but at the same time it can be easily shaped and ground. The size of the handle is easily changed by adding or subtracting layers of fiberglass, and G-10 comes in a huge variety of colors. This means that manufacturers can provide customers with a huge choice in every aspect of their handles, from the grip pattern and color to the size and shape without having to spend a lot of extra time and money to make those different choices available. Strength: Fiberglass is already extremely strong and durable, but weaving it makes it stronger. Now, the woven mesh is covered in an epoxy resin, which cures into a hard, plastic-like material. Customization: The fiberglass can be virtually any color as can the epoxy resin. The mesh can also be woven different ways, allowing for some creative textures. Low Maintenance: So not only can you be extremely creative with the knife's handle, you can be sure it will last a very long time. Epoxy doesn't rust or oxidize, doesn't become brittle, and doesn't soften over time. This means that it needs virtually no maintenance, unlike a more traditional bone, wood, or horn handle. It also won't chip like mother of pearl can. Many say that G-10 is the ideal material for making knife handles because it is light, easily workable, does not expand or contract due to normal temperature and moisture exposure, and extremely rugged. Value Added Article Produced by KnifeArt.com. If you enjoy the article and it helps in your knife search, we would love to have you as our customer. Links and social shares also appreciated. Silver Twill: Silver twill G10 has the look of "silver carbon fiber" but it is not made from carbon fibers. The fiberglass fabric is coated with aluminum, a trademarked material called Hexcel Texalium, and immersed in clear epoxy resin creating silver twill g10. Silver Twill G10 has the three dimensional visual property of carbon fiber. G10 can also have integrated metal wire like copper or bronze. Additionally, the resigns or the glass fibers can have a variety colors.